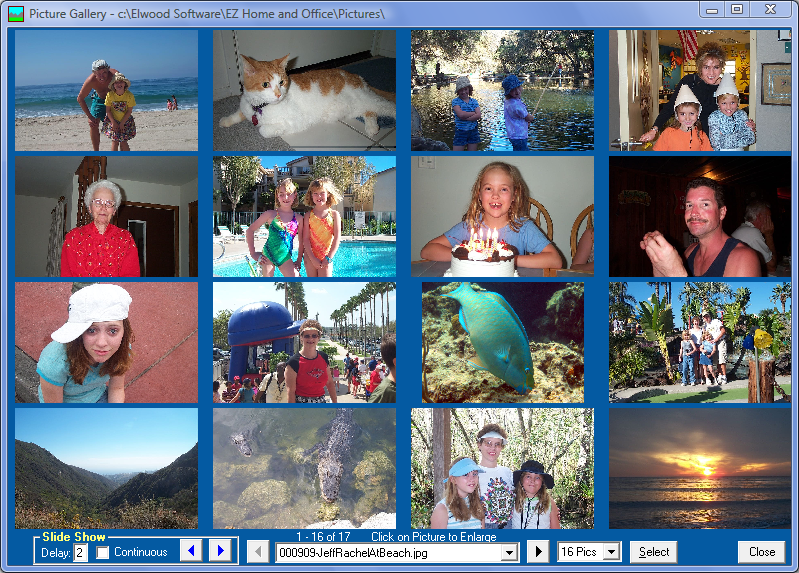 View the pictures on your computer in the EZ Home and Office Picture Gallery. Pictures can be displayed for any folder on your computer and can be viewed one, four or sixteen at a time. Select a delay in seconds and use the Slide Show to continuously view the pictures on your computer. With 'Select Features' on the Tools Menu you can remove the Picture Gallery and other functions to simplify the program. Picture Gallery screen shot and information below. Click on the toolbar or select 'Picture Gallery' from the Features Menu to view pictures on your computer by directory. The default directory for viewing pictures is the EZ Pictures Directory but you can click 'Select' to choose another directory on your computer. Pictures are automatically copied to the EZ Pictures Directory when a picture is selected on the EZ Address Book Screen. Pictures can also be copied to the EZ Pictures Directory by selecting 'EZ Pictures Directory' from the Tools Menu. JPG, JPEG, GIF, and BMP files can be viewed. Select a picture to view from the drop-down list or click or . You can view 1, 4, or 16 pictures at a time by selecting from the drop-down list. The Picture Gallery Screen can be maximized or resized. To run the Slide Show, enter a 'Delay' in seconds between pictures, check if you want the Slide Show to be 'Continuous' (start over when the end is reached), and click either the forward or backward button. Click to stop the Slide Show.